Bob and Mike Bryan are the world No. 1 doubles team. Mardy Fish is the U.S. team's No. 1 singles player. John Isner upset Roger Federer in the second singles match of the U.S. vs. Switerzland first round tie.. The U.S. Davis Cup Team headed to Switzerland for its first-round tie as the decided underdog, playing Roger Federer in his home country on indoor clay at altitude, and emerged as the victor and giant killer. Behind two amazing singles performances from John Isner, who defeated Federer for the first time, and Mardy Fish, who defeated Stanislas Wawrinka in a marathon five-setter, and a solid doubles clincher from Fish and Mike Bryan over Federer and Wawrinka, the U.S. moved on to the quarterfinals with the dominant and improbable 4-1 win. The prize was a quarterfinal meeting with an even deeper team, France, away at the Monte Carlo Country Club, on outdoor red clay, April 6-8. However, with the confidence gained from defeating arguably the greatest player in history in his country, U.S. Davis Cup Captain Jim Courier’s team of Mardy Fish, John Isner and Bob and Mike Bryan knows it will face five difficult matches again. The players also know they can definitely keep advancing with good preparation to reach the semifinals for the first time since 2008. The U.S. will face a French team of world No. 6 Jo-Wilfried Tsonga, world No. 14 Gael Monfils, Julien Benneteau and Michael Llodra, which was the same French team that defeated Canada 4-1 in the first round. Courier has heard that world No. 13 Gilles Simon will also be with the team and could be nominated at Thursday’s official draw ceremony and compete during the weekend, as well. Courier does not expect there to be anything specific to defeating the French team on clay, besides hard work and high-level tennis. "The keys are no different," he said of facing France. "There will be five tough matches. Switzerland's team is definitely not as deep as the French bench. There are going to be five tough matches for us. We have to play our best to stand a chance. We did that with Switzerland." His four-set upset of Federer in Switzerland seems to have lit a spark in Isner, who played some of the best tennis of his life that weekend, believing in himself and using dominant return games to go with his overpowering serve. He has kept up the pace and level of play since then, reaching the final in Indian Wells and moving up to his current career-high ranking of No. 10. Isner has talked about his comfort on clay, and his results have shown it. He pushed six-time Roland Garros champion Rafael Nadal to five sets in the tournament’s first round last year and has one clay-court doubles title on his resume. "It doesn't matter what surface John is playing on, his serve is going to be a nightmare to deal with if he's having a reasonable day, a normal service day. His first and second serves are both so extreme, as far as what angle they're coming in from. He's, I think, gaining in confidence in that department, which is something to see," Courier said. "He’s very comfortable on the surface and feels confident he can have good results on it. Not having a mental obstacle, that's a big part of the puzzle," he added of Isner. "If he has time to set up and put some power behind the ball, as I think I said maybe in December, he's the most destructive force in tennis. He's unplayable against if he does what he does very well." Against the French team, Isner has a 3-3 record against Monfils, although the two have never played on clay, and Fish and Monfils have not played since 2008. Monfils has been struggling this year with a knee injury, which limited him to just playing the fifth singles rubber in the first round, and he just returned to competition at the Sony Ericsson Open last week for the first time since then, so it is possible Simon could play in his place. Tsonga was the dominant force in France’s first-round win, winning both his singles matches, including providing the clinching point in the fourth singles rubber. Tsonga and Isner are 1-1 in their career meetings, including a win for Tsonga at the Paris Masters last year, and the Frenchman holds a 2-0 advantage over Fish, including coming back from a two-set deficit to defeat him at the 2011 US Open. For Fish, the world No. 8 and the U.S. team’s No. 1 singles player, he has not had the best start in 2012, Davis Cup aside, and just last week had his best ATP Tour performance of the season with a quarterfinals appearance at the prestigious Sony Ericsson Open. It was the first time this year he had reached the quarterfinals or better in a tournament. He also has started working with Mark Knowles, the great doubles player, the past few weeks as a new coach, giving him a new voice and perspective to his game, which Courier thinks will help get the American back on the right track to finding his top-level game again. "There is a new voice in his ear. That always hits a bit of a refresh button for a player, which it looks like he needed after the start of the season," Courier said of Fish’s new partnership with Knowles. "Other than Davis Cup, it had been a pretty tough start for him. I think he's gotten himself back on track and is back out there fighting, competing and grinding. He's not playing his best tennis yet, but he's playing better and competing a lot better." If Simon, the world No. 13, were to step in, he has excelled on clay, winning four of his nine career singles titles on the surface. He defeated Fish at Roland Garros last year in straight sets but is 0-2 against Isner, who recently defeated the Frenchman on his way to the final in Indian Wells, as well as in the fourth round of the 2011 US Open. The two have never met on clay. For doubles, the world No. 1 Bryans have been nothing but clutch in their Davis Cup careers, both with 20-2 overall records and 19-2 together. Bob missed the first-round win over Switzerland due to the recent birth of his first daughter, Micaela, a few days prior. 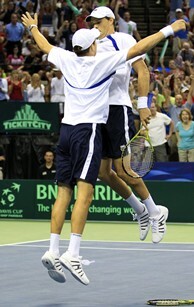 "Mike and Mardy made a great pick-up team in Switzerland," Courier said of Fish and Mike Bryan’s win. "As a captain, to have the world's best on your team at any level is obviously a great comfort. I think it will be to everyone's benefit to have the singles guys focused on singles and getting some rest on Saturday and Bob and Mike getting ready to go to battle on doubles Saturday." French Captain Guy Forget likely will nominate Benneteau and Llodra for doubles, as the two defeated Milos Raonic and Daniel Nestor in France’s win over Canada. The pair is not too bad in singles, either, with Benneteau ranked No. 33 and Llodra at No. 43. France is looking to advance to the semifinals for the third year in a row, while the U.S. is not only looking to reach the semifinals for the first time since 2008 but also for the first time under Courier, who knows his team can do it. "I'm not convinced the four players he presented are the four players that will be nominated come next Thursday," Courier said of the French team. "They might be. But we're not too focused on that. We'll be able to focus in on Thursday (at the draw ceremony) when we know exactly who Guy nominates, and we'll go from there. Great team he has to work with. "We know it's going to be a tricky one all the way around," he added. "We'll be well prepared. We’re happy to be playing there, and we’ll look forward to laying it out there."